I've never been that excited to the extend of cooking one of the recipe from the recipe book I bought right away (as in on the same day). This was my first. I am glad I bought Alex Barker with recipes by Sally Mansfield Potato Cookbook. The potato dish was so yummy! There is no need for us to hunt down the onions before eating. I sure like the combination of sweet and spicy sauce. I will definitely cook more of this again in near future! The recipe calls for small new or salad potatoes. We were both too lazy to step out of the house again just to buy potatoes. I substituted them with blue bell potatoes. Also, I didn't realised I ran out of tomato in can. I ended up crushing 4 large vine tomatoes with my blender and added a large dollop of tomato paste instead. 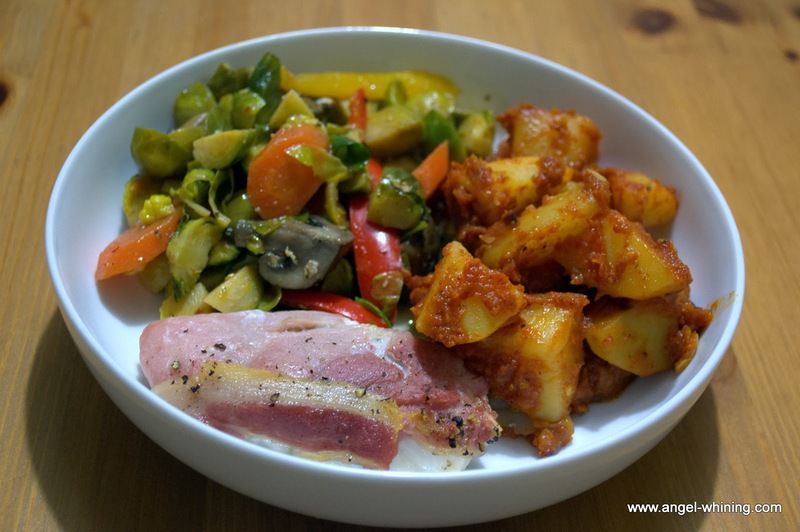 Spanish chilli potatoes, bacon wrapped cod and baked brussel sprouts, carrots, chestnut mushrooms and sweet peppers. Overall it is still a healthy meal- besides the bacon I specially cooked for hubby. It's sad I don't see my weight going down despite having such healthy meals for past 15 days. 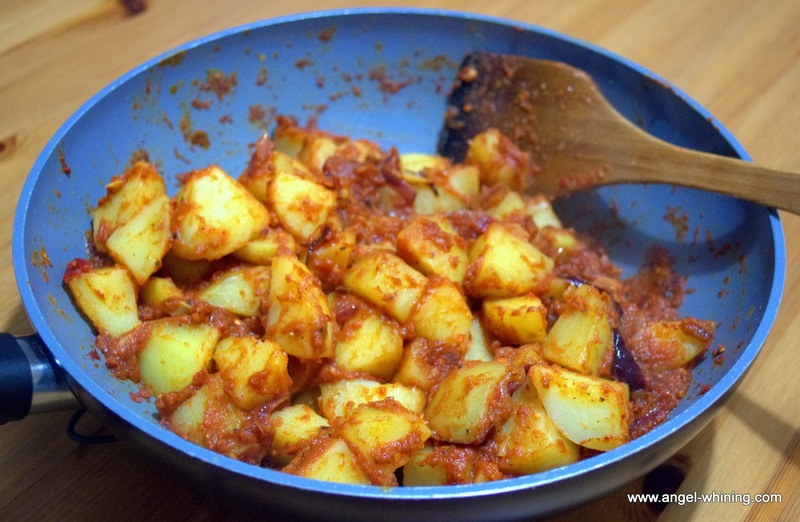 Peel, chop and cook the potatoes in boiling water. Drain and leave to cool. Stir in tomatoes, tomato paste, vinegar, chilli powder and paprika. Bring it to boil.